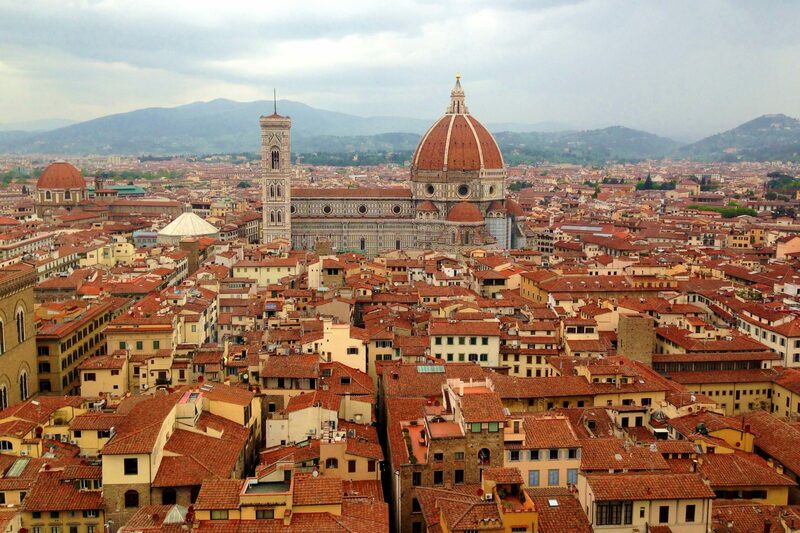 If you are willing to visit Italy, make sure to include in your itinerary a weekend in Florence! This open piazza is the front “yard” of what was once the ruling Medici family’s home, the Palazzo Vecchio. There is a “David” replica standing at its entrance, and to the right you can admire “The Loggia”, a fantastic outdoor sculpture gallery. Palazzo Vecchio is the most important civil building in the city of Florence. The entire palace is a museum,and it is worth seeing the “Salone dei Cinquecento”, the study of Francesco I de’ Medici and the room of the Elements. 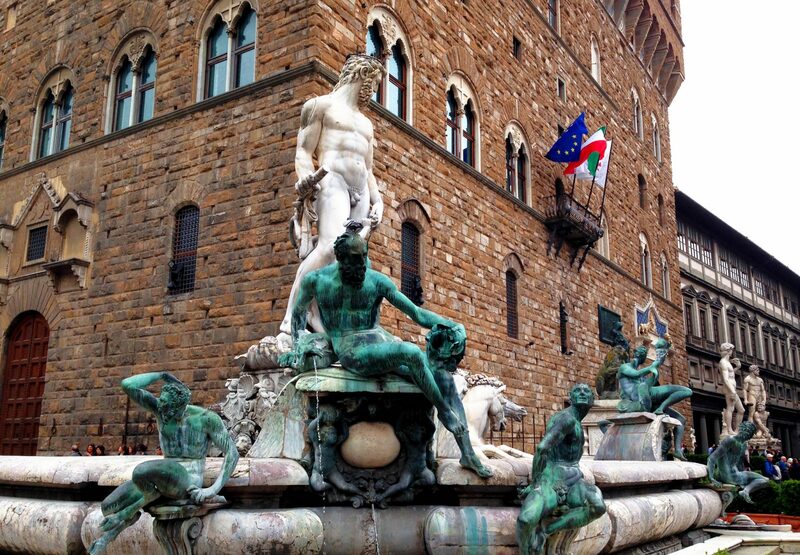 On the corner of the Palazzo Vecchio there is the famous fountain with the figure of Neptune in white Carrara marble by sculptor Bartolomeo Ammannati. Actually, this statue is a copy made in the nineteenth century, while the original is in the National Museum. 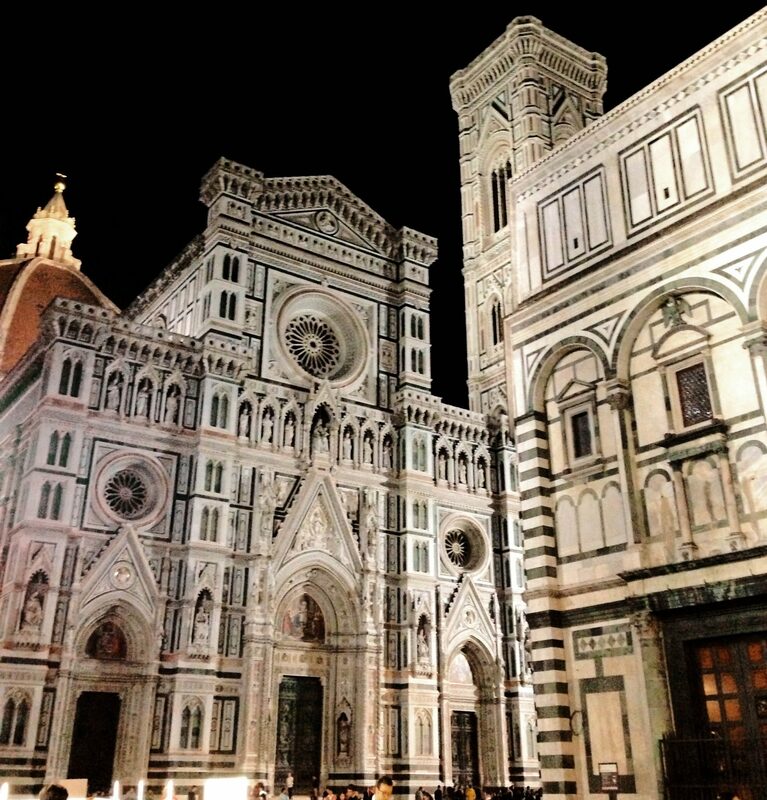 The Cathedral (“Duomo”) is dedicated to Santa Maria del Fiore and was designed by Filippo Brunelleschi. Finished around 1367 it was completely covered with colored marble. The interior, by contrast, is pretty stark and plain but quite enjoyable on warm summer days since the temperature inside tends to be cooler. The mosaic pavements are certainly its main attraction within. This is a square rich with delights, whether it be the Baptistery or Giotto’s “campanile” or bell tower. After seeing the Duomo from all sides and visiting the inside of the cathedral, all you need to do to complete the experience is climb to the top of the cupola (not for the faint-hearted!). 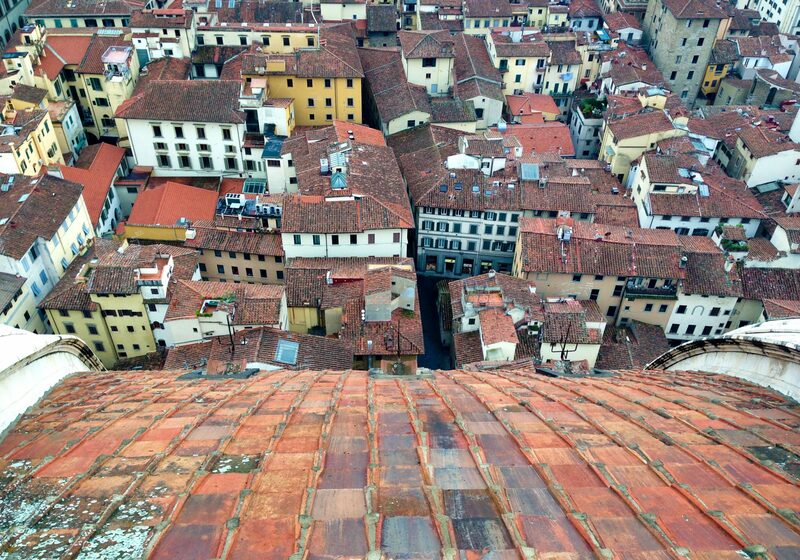 The only way to see the inside of the dome up close and enjoy the extraordinary view of Florence it offers is to climb its 463 steps (there is no elevator): the route takes you by the interior of the dome where you can admire Giorgio Vasari‘s frescoes of the Last Judgment up close. 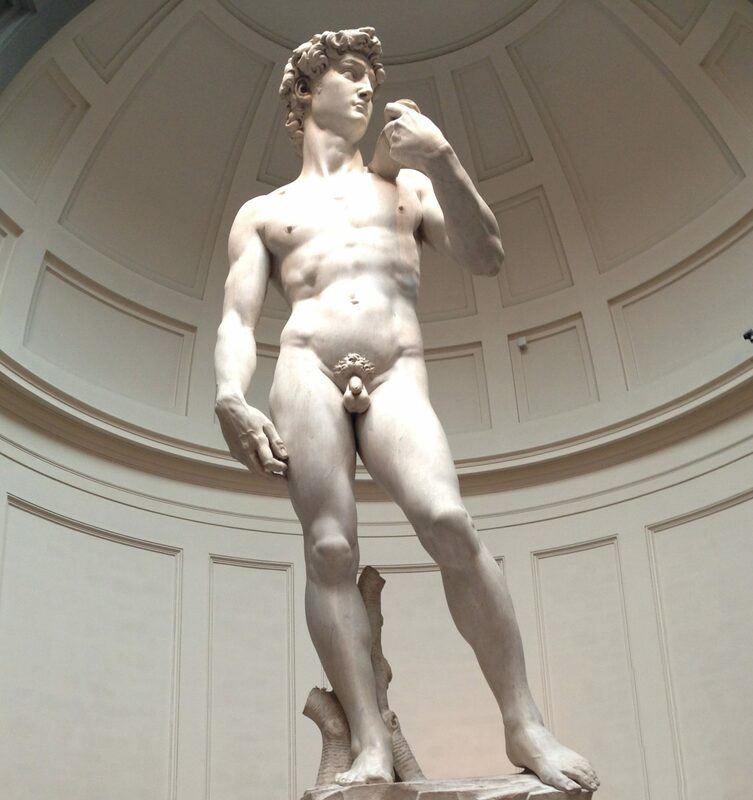 If you’re thinking of visiting the Galleria dell’Accademia, your most likely target are the magnificent giant marble sculptures created by Michelangelo, and above all, the glorious David. If you explore the museum with a bit more time, the Accademia will offer you much more in the less crowded halls, satisfying any curiosity for botany, music, art symbols and painting techniques. 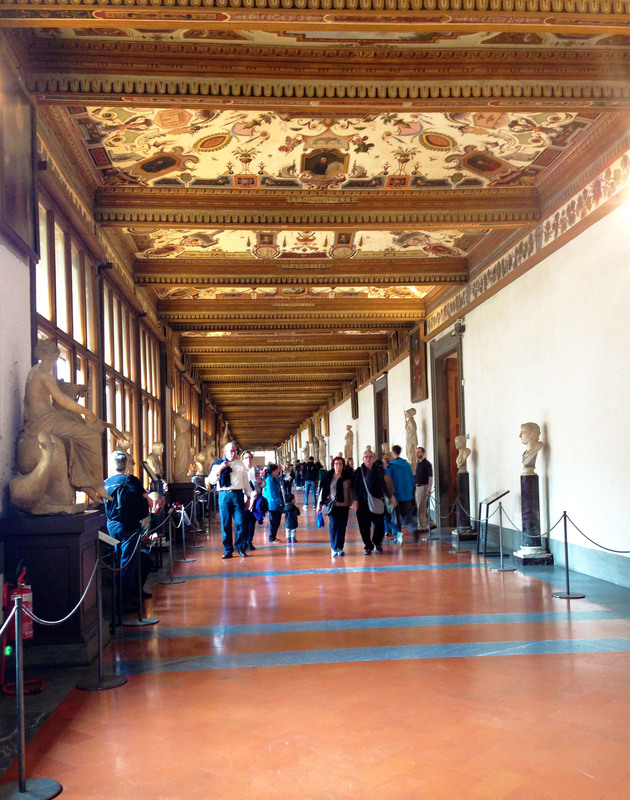 The Uffizi Gallery is one of the greatest museums in Italy and the world. The Uffizi were intended to house the offices of the famous Medici family. From the beginning, however, the Medici set aside certain rooms to house the finest works of art from their collections. Today the Uffizi contains masterpieces by Italian and foreign artists from the 13th to the 18th century, such as Giotto, Masaccio, Leonardo da Vinci, Botticelli, Michelangelo, Piero della Francesca, Raphael, Caravaggio, along with Rubens, Rembrandt, Dürer, Goya and many others. If you want to go into the Uffizi Gallery, you should buy Uffizi tickets online ahead of time, because there is most often a long line outside. Plan to spend at least 2 hours inside the museum. Palazzo Pitti is one of the city’s impressive, yet overwhelming, art galleries. Built as the residence of banker Luca Pitti around the year 1458, it was later purchased by the Medicis and served as the main residence for the Dukes of Tuscany. The Pitti Palace is connected to Palazzo Vecchio via the Vasari Corridor. Though it may be art over-kill, for the serious art- and history-lover the palace is worth a visit. Not only will you see paintings by Caravaggio, Raphael, Rubens and Titian, as well as a number of obscure pieces by other artists of the Renaissance. This view would be the perfect ending of a weekend in Florence. 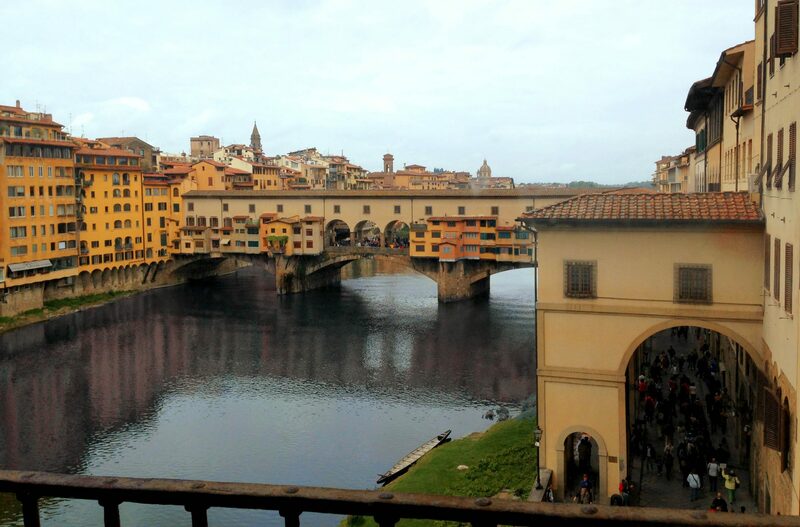 It is Florence’s oldest bridge (14th century) but I have to admit that isn’t much of a looker up close – unless you’re a fan of over-priced jewellery shops and crowds of tourists. From a distance, though, this medieval craftsmanship is really impressive, so head down stream to Ponte Santa Trinita to take your pictures! Any suggestion for a Weekend in Florence? Leave a comment and let me know!